EtherCAT is by far the fastest industrial Ethernet technology. In particular in the rapidly growing application areas of Automation 4.0, the Internet of Things and M2M communication, EtherCAT results in higher precision if the right components are used, to increase throughput and with this also to lower costs in all areas of automation and controlling. 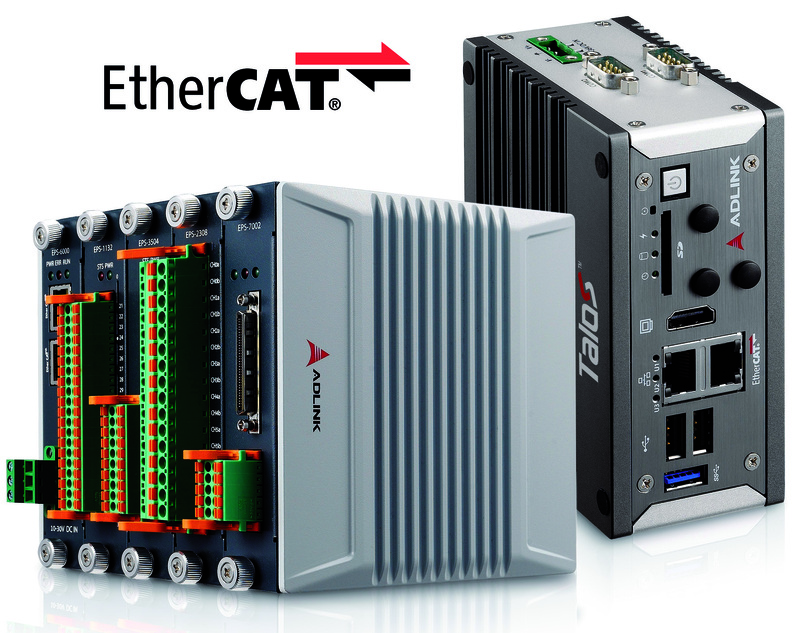 Therefore, the German distributor Acceed has incorporated the latest EtherCAT components from the manufacturer Adlink in its portfolio, including the master controller Talos 3012 and the modular slave system EPS with a large variety of modules including analogue and digital I/Os, motion controllers, communication and measurement modules. The protocol defined in IEC Standard 61158 forms the basis for real time applications in automation technology. Through outstanding synchronisation precision and extremely short reaction times, the transitions between individual process steps are accelerated and applications overall considerably more efficient. Neither switches nor hubs are required and there are practically no restrictions when selecting the bus topology and the number of nodes. EtherCAT has already been used successfully for several years, also for robot applications, production systems, manufacturing machinery, test stands, measurement systems, interlinked machines and for building control. Adlink Technology is a member of the EtherCAT Technology Group, the fieldbus association with the most members and which is the most active worldwide. The EtherCAT products from Adlink form a package consisting of specialised hardware via middleware up to software for configuration, controlling and monitoring. The merely palm-sized master controller Talos-3012 works with an Atom E3845 quad core processor (1.9 GHz), supports 10,000 I/O pixels in the slave system and up to 64 axes. With the help of the LinkMasterPro software, the controller is able to recognise slave systems and I/O modules independently and to establish the configuration without additionally necessary settings. The controller can easily be integrated into existing EtherCAT slave systems and remains open for further expansions. The Talos-3012 enables the transfer of old PLC controllers to modern, PC-based, high-performance and quickly availabnle automation applications. The hot swap-compliant modules simplify the operation, servicing and changes to the configuration. Assembly and exchange are possible with minimal time required. Similarly, remote monitoring of the performance of all the slave systems and modules, diagnosis and automatic reporting are supported. All EtherCAT devices from Acceed are developed for industrial requirements and harsh environmental conditions and can be used under temperature conditions from -20 to +60°C. You can find further technical details for all EtherCAT products on the Acceed website, where you can also order the components directly.